Hydrangea ‘Bodensee’, or hydrangea macrophylla ‘Bodensee’ with its full Latin name, is a well-known variety of the deciduous shrub hydrangea. Their flowers truly set macrophyllas apart from hydrangea varieties. These flowers can be either blue or pink/purple depending on soil conditions. If the soil pH is below 7 (a pH of 7 is neutral, below 7 is acidic), the flowers tend to be more bluish in colour, whereas alkaline soils (pH value above 7) produce pinkish flowers. Off-white flowers in neutral soils have also been reported. The soil can be treated to attain the desired colour, which is not uncommon, as many garden enthusiasts prefer the blue macrophylla ‘Bodensee’ to the pink one. The flowers unfold in July in large rounded clusters backed by pale green toothed leaves. The flowering season ends in September, when the once-beautiful flowers turn brown and wither, but remain on the shrub until they are deadheaded. Deadheading is recommended to improve the plant’s appearance. Hydrangea ‘Bodensee’ is an old European variety, which will thrive in almost any soil available. Moist, well-drained, humus-rich, fertile soils are best for hydrangea ‘Bodensee’, but it will be fine in a neutral or alkaline soil as well. Soil types with excessive amounts of chalk are best avoided. Hydrangea ‘Bodensee’ is not a particularly demanding hedge plant when it comes to sunlight, thus it can be grown in anything from full sun to full shade. It can even deal with coastal sites, but caution must be taken with drying winds, which can be detrimental to this water-loving shrub. 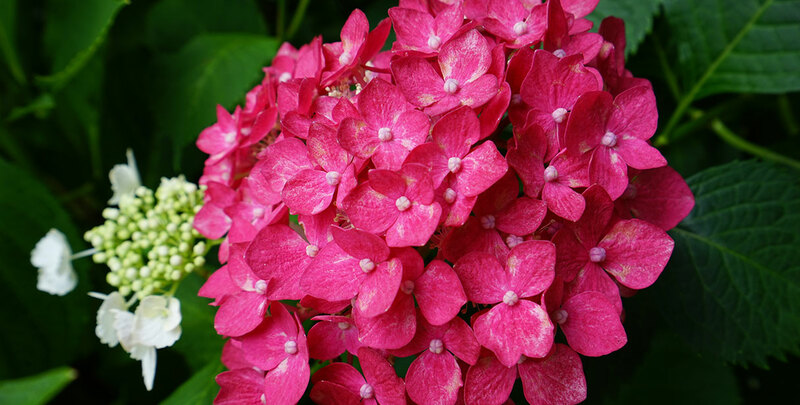 Hydrangea ‘Bodensee’ needs supplemental watering in dry periods. An otherwise hardy plant, small plants are less tolerant of harsh winter cold and may need some protection, for example from a west-, north- or east-facing wall. Established plants are generally quite hardy and can handle themselves. Hydrangea ‘Bodensee’ is an excellent choice for border hedges, informal hedging or as a specimen shrub. Pruning is not a requirement, unless you prefer a neat hydrangea hedge for a garden with a more formal appearance.